Talking about Phirni, there are different stories talked about its origin, some believe it came into existence during the Mughal era, as a royal desert. Today Phirni is a popular sweet dish not only in India but in Pakistan too and even after so many years it is till served in traditional style – earthen pot ware (Mitti Ke Kulhad or Matki). In ancient times refrigerators were not invented so serving Phirni in earthen vessels had a purpose behind, it remains chilled for a longer duration and has a peculiar pleasing taste to it. The Phirni served in glass or steel bowls, lacked the soul of this sweet dish. To prepare the Phirni, wash and soak rice in water for about 1 hour. Make a fine powder of pistachio, almond and cardamom in a mixer. Set aside till required. Drain soaked rice in a colander, pat dry rice on an absorbent kitchen towel. Add ½ Cup of milk (at room temperature) to the powdered rice and mix well to make a paste. Keep aside. Boil remaining milk in a heavy bottomed pan, reduce the heat to low once milk starts bubbling. Now stir in the rice paste, saffron mixture and dry fruits powder. Keep on stirring frequently until the pudding starts to thicken which will not take long after you add rice paste to milk. Now add sugar. 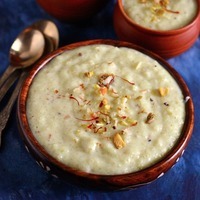 At this stage, it is always better to taste Phirni and adjust the amount of sugar accordingly. Once all the sugar is dissolved and rice is cooked, the pudding is ready. Now if you like it a little loose and flowing Phirni then turn off the heat. If like it thicker like I do then cook a little further. Turn off the heat, let Phirni cool down for some time. Stir it every once in a while preventing it from forming a thick layer on top. Once Phirni has cooled down pour it into earthenware containers. Keep in the fridge for at least 1 hour before serving. I keep it for a longer duration like 4 – 5 hours. Serve Rice Phirni chilled garnished with chopped nuts and saffron strands. A very nice recipe you got there. I like the rustic and pure nature of this recipe. It reminds me of the rice pudding my mom made when I was a child. I just recently found some organic cardamom pods at the market and have all the other ingredients on hand as well. I even have some cool single serving ceramic bowls to place the recipe in, trying it this week!! Thanks for sharing. Great :) hope you tried the recipe and liked it.